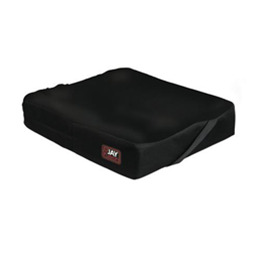 The JAY® Fusion™ is an adjustable cushion designed for skin protection that features JAY Flow™ Fluid or ROHO DRY FLOATATION® air insert options in a package that's comfortable, stable and supportive. The Fusion features a contoured foam based constructed from closed cell foam. This makes it easy to modify in our factory or in the field. 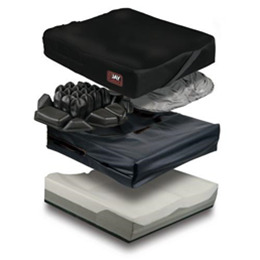 Additional positioning is provided by the soft, contoured top layer. Its femoral transition and rear wall help prevent fluid migration while gently supporting the trochanters and posterior pelvis. Choose the Reduced Profile Option to lower the Fusion's overall height by 5/8" and maintain a lower seat-to-floor height. The width of the Fusion's Pelvic Loading Area was determined by using the average pelvic bone measurements of users of each cushion width. This accommodates the vast majority of individuals, offering forward and lateral stability for proper positioning, and optimal immersion and weight distribution to protect the skin from breakdown.